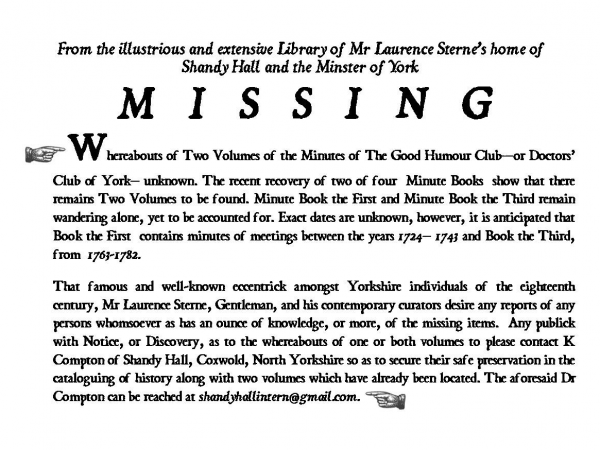 Our researchers have discovered that there were four volumes of minutes for the Good Humour Club in total, spanning the period between approximately 1725 and 1800. Book Four has recently been located at the Minster Library in York and the search is now on for Books One and Three. Please get in touch if you have any information that might help us to find them! The 270-year-old Minute Book from The Laurence Sterne Trust’s collection, expertly restored, is on display at the Shandy Hall Gallery as part The Good Humour Club Exhibition from 30 June to 30 September 2013. 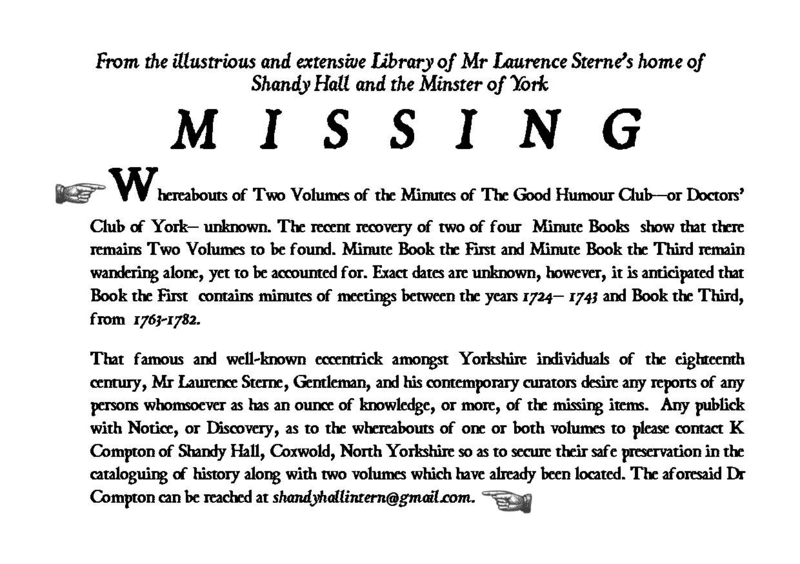 You can also handle a facsimile reprint of the 1782-1800 volume found in the York Minster Library. The new minute book provided by Caesar Ward (MB2) on 30 June 1743 is the second. This is the book in the Laurence Sterne Collection. It starts with a listing of the new articles (1-5). The last entry in this book is on 6 May 1762. By order of the Club Jn: Busfield Secretary. 13 Feb 1755 As there is no rule concerning the admission of a Member of this Club, it is this night unanimously agreed that for the future any person desirous to be admitted a Member, shall be introduced As a stranger; and pay as such; the next night he is to be proposed but not then admitted, unless a majority of the Club be then present and vote unanimously upon ballot for him. The Good Humour Club, or The Doctors’ Club? John Ward Knowles’s notes about the Doctor’s Club record that this society was formed in 1781 and he also similarly lists articles now numbering 12. This would imply that he has seen another minute book starting in 1781 which he assumed was the first. This would be MB4 with MB3 covering the years 1761 – 1781. George Benson, however, says that the Good Humour Club was in existence by 1748 when James Nares, the Minster Organist joined* but he thinks that there was another club which held its meetings at Sunton’s Coffee House of which Laurence Sterne was an habitué . He says that the Doctors Club was a separate organisation that existed between 1771 and 1800 and met at the York Tavern. It is significant that this date for its founding was when Matthew Kidd became the landlord of the York Tavern after moving from the coffee house in Coney St. It is more likely, however, that this is a misreading for 1781. Thus both Knowles and Benson are referring to the same minute book which is now located in York Minster library where it was seen by Michael Brown, a DPhil student at the University of York, while researching for his chapter ‘From the Doctors’ Club to the Medical Society: Medicine, Gentility and Social Space in York 1780 – 1840’ (pp.59-69) in Eighteenth Century York: Culture, Space and Society (2003) edited by Mark Hallett and Jane Rendall. Knowles, Benson and Brown all think the minute book they have seen covers the life of the club from its apparent founding in 1781 until 1800. The list of articles in MB2 is prefaced by ‘Memd: July 2d 1743. a committee of the club having been appointed at the last Club held on 30th June with full powers to review the former articles of the Club…’ An earlier existence of the Club is thus implied which cannot be deduced from the entries in MB4. It would also appear that the usage of the familiar name of ‘Doctors Club’ given to the Good Humour Club is contemporary with this latter book. Where are minutes books 1 and 3? They do not appear to be in local collections at the City Reference Library, the Minster Library or the Borthwick Institute. *Did Benson see the Shandy Hall minute book (MB2) and misread the date on the front board as 1748? Nares was already a member on 7 July 1743 and married in 1748.